“The subject presented in the memorial is one upon which I have thought much for weeks past, and I may even say for months. I am approached with the most opposite opinions and advice, and that by religious men, who are equally certain that they represent the Divine will. I am sure that either the one or the other class is mistaken in that belief, and perhaps in some respects both. I hope it will be irreverent for me to say that if it is probable that God would reveal his will to others, on a point so connected with my duty, it might be supposed he would reveal it directly to me; for, unless I am more deceived in myself than I often am, it is my earnest desire to know the will of Providence in this matter. And if I can learn what it is I will do it! These are not, however, the days of miracles, and I suppose it will be granted that I am not to expect for a direct revelation. I must study the plain physical facts of the case, ascertain what is possible and learn what appears to be wise and right. The subject is difficult, and good men do not agree. For instance, the other day four gentlemen of standing and intelligence (naming one or two of the number) from New York called, as a delegation, on business connected with the war; but, before leaving, two of them earnestly beset me to proclaim general emancipation, upon which the other two at once attacked them! You know, also, that the last session of Congress had a decided majority of anti-slavery men, yet they could not united on this policy. And the same is true of the religious people. Why, the rebel soldiers are praying with a great deal more earnestness, I fear, than our own troops, and expected God to favor their side; for one of our soldiers, who had been taken prisoner, told Senator Wilson, a few days since, that he met with nothing so discouraging as the evident sincerity of those he was among in their prayers. But we will talk over the merits of the case. Thus invited, your delegation very willingly made reply to the following effect; it being understood that a portion of the remarks were intermingled in the way of conversation with those of the President just given. We observed (taking up the President’s ideas in order) that good men indeed differed in their opinions on this subject; nevertheless the truth was somewhere, and it was a matter of solemn moment for him to ascertain it; that we had not been so wanting in respect, alike to ourselves and to him, as to come a thousand miles to bring merely our opinion to be set over against the opinion of other parties; that the memorial contained facts, principles, and arguments which appealed to the intelligence of the President and to his faith in Divine Providence; that he could not deny that the Bible denounced oppression as one of the highest crimes, threatened Divine judgments against nations that practice it; that our country had been exceedingly guilty in this respect, both at the North and South; that our just punishment has come by a slaveholder’s rebellion; that the virus of secession is found wherever the virus of slavery extends, and no farther; so that there is the amplest reason for expecting to avert Divine judgments by putting away the sin, and for hoping to remedy the national troubles by striking at their cause. We observed, further that we freely admitted the probability, and even the certainty, that God would reveal the path of duty to the President as well as to others; provided he sought to learn it in the appointed way; but, as according to his own remark, Providence wrought by means not miraculously, it might be, God would use the suggestions and arguments of other minds to secure that result. We felt the deepest personal interest in the matter as of national concern, and would fain aid the thoughts of our President by communicating the convictions of the Christian community from which we came, with the ground upon which they were based. That it was true he could not now enforce the Constitution at the South; but we could see in that fact no reason whatever for not proclaiming emancipation, but rather the contrary. The two appealed to different classes; the latter would aid, and in truth was necessary to re-establish the former; and the two could be made operative together as fast as our armies fought their way southward; while we had yet to hear that he proposed to abandon the Constitution because of present difficulty of enforcing it. As to the inability of Congress to agree on this policy at the late session, it was quite possible, in view of subsequent events, there might be more unanimity at another meeting. The members have met their constituents and learned of marvellous conversions to the wisdom of emancipation, especially since late reverse have awakened thought as to the extreme peril of the nation, and made bad men as well as good men realize that we have to deal with God in this matter. Men of the most opposite previous views were now uniting in calling for this measure. That to proclaim emancipation would secure the sympathy of Europe and the whole civilized world, which now saw no other reason for the strife than national pride and ambition, an unwillingness to abridge our domain and power. No other step would be so potent to prevent foreign intervention. Furthermore, it would send a thrill through the entire North, firing every patriotic heart, giving the people a glorious principle for which to suffer and to fight, and assuring them that the work was to be so thoroughly done as to leave our country free forever from danger and disgrace in this quarter. We added, that when the proclamation should become widely known (as the law of Congress not been) it would withdraw the slaves from the rebels, leaving them without laborers and soldiers. That the difficulty experienced by Gen. Butler and other Generals arose from the fact thathalf-way measures could never avail. It is the inherent vice of half-way measures that they create as many difficulties as they remove. It is folly merely to receive and feed the slaves. They should be welcomed and fed, and then, according to Paul’s doctrine, that they who eat must work, be made to labor and to fight for their liberty and ours. With such a policy the blacks would be no incumbrance and their rations no waste. In this respect we should follow the ancient maxim, and learn of the enemy. What the rebels most fear is what we should be most prompt to do; and what they most fear is evident from the hot haste with which, on the first day of the present session of the Rebel Congress, bills were introduced threatening terrible vengeance if we used the blacks in the war. We answered that, being fresh from the people, we were naturally more hopeful than himself as to the necessity and probable effect of such a proclamation. The value of constitutional government is indeed a grand idea for which to contend; but the people know that nothing else has put constitutional government in danger but slavery; that the toleration of that aristocratic and despotic element among our free institutions was the inconsistency that had nearly wrought our ruin and caused free government to appear a failure before the world, and therefore the people demand emancipation to preserve and perpetuate constitutional government. Our idea would thus be found to go deeper than this, and to be armed with corresponding power. (“Yes,” interrupted Mr. Lincoln, “that is the true ground of our difficulties.”) That a proclamation of general emancipation, “giving Liberty and Union” as the national watch-word, would rouse the people and rally them to his support beyond any thing yet witnessed — appealing alike to conscience, sentiment and hope. He must remember, too, that present manifestations are no i[n]dex of what would then take place. If the leader will but utter a trumpet call the nation will respond with patriotic ardor. No one can tell the power of the right word from the right man to develop the latent fire and enthusiasm of the masses. (“I know it,” exclaimed Mr. Lincoln.) That good sense must of course be exercised in drilling, arming and using black as well as white troops to make them efficient; and that in a scarcity of arms it was at least worthy of inquiry whether it were not wise to place a portion of them in the hands of those nearest to the seat of the rebellion and able to strike the deadliest blow. That in case of a proclamation of emancipation we had no fear of serious injury from the desertion of Border State troops. The danger was greatly diminished, as the President had admitted. But let the desertions be what they might, the increased spirit of the North would replace them two to one. One State alone, if necessary, would compensate the loss, were the whole 50,000 to join the enemy. The struggle has gone too far, and cost too much treasure and blood, to allow of a partial settlement. Let the line be drawn at the same time between freedom and slavery, and between loyalty and treason. The sooner we know who are our enemies the better. David H. Donald, editor, Inside Lincoln’s Cabinet: The Civil War Diaries of Salmon P. Chase, p. 130 (September 10, 1862). 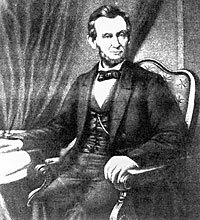 Noah Brooks, Abraham Lincoln: The Nation’s Leader in the Great Struggle through which was Maintained the Existence of the United States, p. 307. Roy P. Basler, editor, The Collected Works of Abraham Lincoln, . Allen Thorndike Rice, editor, Reminiscences of Abraham Lincoln, p. 528 (James C. Welling). Roy P. Basler, editor, The Collected Works of Abraham Lincoln, Volume V, p. 419-425 (September 15, 1862). Allen C. Guelzo, Abraham Lincoln: Redeemer President, p. 341. Allen Thorndike Rice, editor, Reminiscences of Abraham Lincoln, p. 530-531 (James C. Welling). John G. Nicolay and John Hay, Abraham Lincoln: A History, Volume VI, p. 156-157.